NACHC has been closely following the developments in the destructive aftermath of Hurricane Florence and we are still patching together field reports from various sources. 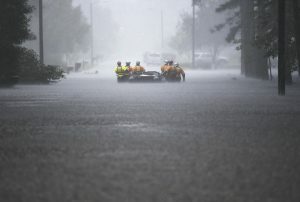 Widespread flooding is still being reported in North and South Carolina, making transportation and emergency medical aid difficult. Continued flooding is expected through the week. Several health centers in the affected areas have already received emergency health kits from Direct Relief (see blog post) designed to treat up to 100 patients for three to five days. 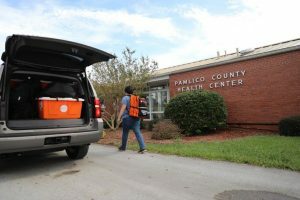 There have also been medical backpacks delivered to supply providers for mobile care or shelter care and the organization is preparing to send in supplies of insulin. In addition to Direct Relief, there are a host of volunteers, relief organizations ready to donate medical supplies or manpower. With food and medicines hard to access, NC health officials have also announced efforts to make it easier for vulnerable families to access hot meals. The North Carolina Department of Health and Human Services has also opened up medical shelters for people with complex health needs and is working with federal and county partners to provide additional flexibility to people enrolled in the Medicaid program and their health care providers during and after Hurricane Florence. A number of issues arise for health centers operating in disaster zones — from the scope of service questions to Federal Tort Claims Act (FTCA) considerations. NACHC has a targeted web page with emergency management technical assistance resources, including a link to the HRSA/BPHC Emergency Management/Disaster Relief resources page that can be accessed by visiting this link. We will keep you posted on further developments as more information comes in.